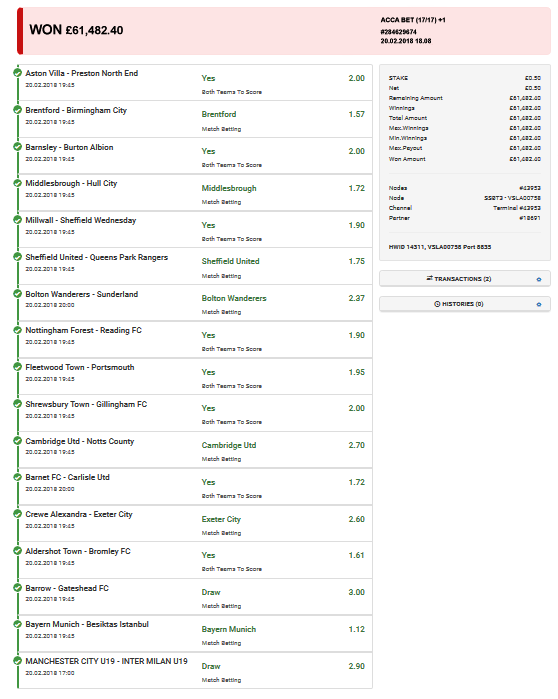 One Ladbrokes customer had a night to remember on Tuesday, turning 50p into a whopping £61,482 after correctly predicting the outcome of 17 matches across Europe. An incredible string of dramatic twists and turns kept our plucky punter in suspense until right at the end – with six games needing goals in the final 10 minutes to complete the biggest football win we’ve seen this year. It took some truly unbelievable scenes to see Exeter City pull off their victory at Crewe Alexandra. This bettor’s dream seemed to be over when the Railwaymen went 1-0 up with an 88th-minute goal. But Exeter grabbed a 92nd-minute equaliser from Jordan Moore-Taylor, before Jayden Stockley headed home a winner in the fifth minute of added time! That was one of seven perfect predictions on the BTTS front, with Gillingham also leaving it late to do their bit in front of goal for this amazing acca.